Moira Automatics of Belleville is your expert partner for pedestrian door service and installation. We service and repair all makes and models of automatic doors from all manufactures. 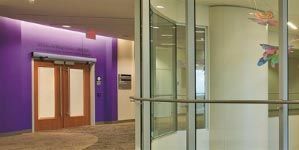 Automatic commercial doors welcome visitors, guide traffic, and help preserve indoor climate zones. 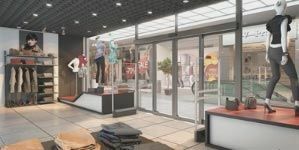 Sliding, swing, and revolving storefront systems, including commercial entrance doors, offer many ways to provide convenience. They also offer secure entrances to meet accessibility standards in any building. Sleek styling and adaptable commercial sliding door configurations create a welcoming and functional entryway. 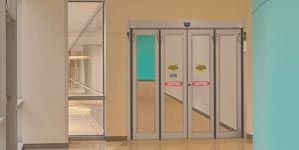 Choose from our attractive and convenient sliding door solutions for your facility. Exterior and interior swinging doors provide flexibility, efficiency and automated convenience for every entrance. Low-energy and full-energy commercial swing door operator configurations. Revolving doors are the ideal solution for energy efficiency and convenience. Our automatic and security revolving doors feature superior design, convenience, and aesthetics for any entrance need. 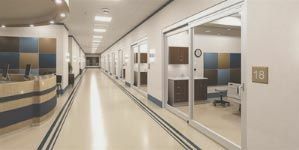 In critical hospital environments, safe and efficient patient care requires a versatile, feature-rich family of sliding, swing and folding ICU doors. Folding automatic doors are the ideal solution for maximizing small openings. We have them available in two, or four, panel configurations, providing automated convenience for the smallest of entrances. Running a good business isn’t just about providing the right service or products to your customers, but also providing them with a welcoming atmosphere. Handicapped persons may not feel welcomed if your public business isn’t equipped with handicap doors and door operators. The good thing about our company is that we help companies like yours that are in need of professional commercial handicap door operator’s service, and for a price that won’t set your business back. Moira Automatic Doors offers crews with the innate ability to provide service, from repairs to installation of all the products in this industry. Whether you need a simple handicap door, or a more complex design that features handicap automatic door openers; we’ve got you covered. Moira Automatic Doors can install handicap doors that require only a press of a button, conveniently mounted for your customers benefit, as well as more complex doors such as automatic sliding doors that will slide open when your customers pass close by. These types of doors make it a cinch for handicapped persons to easily enter and exit your business location. If you have a pre-existing system installed that needs to be fixed, Our Company provides professional opener repair services that will ensure the expert repair of your doors and motors. Our services can be yours with just a quick phone call to one of our friendly representatives who are awaiting your call. We use state of the art tools and parts to ensure you receive the best service possible.